What’s not to love about a market-beating yield with room to grow? It's hard not to appreciate JPMorgan Chase's (NYSE:JPM) dividend when you look at the three metrics that matter most to income-seeking investors: yield, dividend growth, and payout ratio. Taken together, these show that shares of the nation's biggest bank by assets yield more than the broader market and that its dividend has considerable room to increase going forward. The first metric investors use to assess the quality of a dividend stock is yield. This communicates how much a stock pays out each year in dividends relative to its share price, and is calculated by dividing the former by the latter. A higher yield is generally better than a lower yield, though there are exceptions to this rule. These follow from the fact that an unusually high yield connotes high risk. Williams Companies serves as a case in point. The oil and gas pipeline company has seen its shares fall by more than 60% since July 2015, thanks to the dramatic decline in energy prices. The net result is that its dividend yield has shot up to 13%. The goal is thus to find stocks that yield more than the broader market, but not excessively so. A good benchmark is the average yield on the S&P 500, which is currently 2.2%. 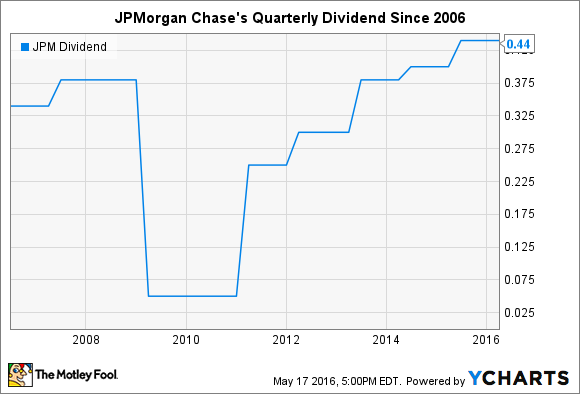 JPMorgan Chase's dividend hits this sweet spot. Its 2.9% yield exceeds the broader market, but not by such a large margin that investors need to be concerned. The second thing that income investors look for in a stock is one that grows its dividend consistently. It isn't an immutable law of nature, but a company that has grown its dividend in the past is more likely to continue doing so in the future. JPMorgan Chase checks this box as well. Although the $2.4 trillion bank slashed its quarterly payout during the financial crisis, like most every other big bank, it's since increased its dividend for five consecutive years. JPM Dividend data by YCharts. The one outlier is that banks with more than $50 billion in assets on their balance sheets must get approval from the Federal Reserve every year to increase their dividends. But even though the central bank has used its veto power over bank capital plans in the past, there's little reason to think that it will interfere with reasonable dividend increases at JPMorgan Chase. Finally, the last metric that shines a revealing light on a stock's dividend is the payout ratio. This measures the percentage of net income that a company distributes every year via dividends. There is no set rule when it comes to the payout ratio, though a smaller number is generally better than a larger one, as the former suggests that a company has plenty of room to increase its distribution in the future. A good benchmark once again is the S&P 500, the average stock on which pays out two-thirds of its income each year to shareholders. JPMorgan Chase's payout ratio is less than half of that, at 30%, according to Yahoo! Finance. This is in line with the capital allocation strategy at most banks, which calls for an equal distribution of net income between dividends, stock buybacks, and retained earnings. In sum, if you're looking for a dividend stock that yields more than the average stock and has room to grow, you could do a lot worse than JPMorgan Chase.